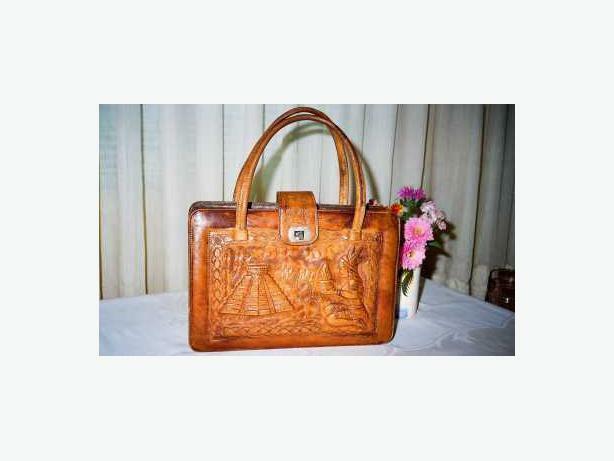 MADE IN MEXICO IN THE MID 1970'S, THIS LEATHER PURSE FEATURES A DECORATIVE HIGH RELIEF PYRAMID AND MAYAN ON ONE SIDE AND A MEDALLION ON THE OTHER. THE INTERIOR HAS 3 COMPARTMENTS WITH THE CENTER ONE ZIPPED. IN ADDITION THERE ARE 2 DEEP SIDE COMPARMENTS. IT IS IN VERY NICE CONDITION. FOR OTHER VINTAGE COLLECTABLES, ANTIQUES AND HOUSEHOLD ITEMS OF INTEREST PLEASE VISIT MY OTHER ADS.